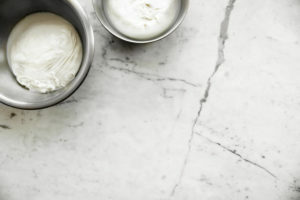 A hands on cheesemaking class: After making our own cheese, we’ll sit down to light snacks featuring washed rind cheeses. This class is for you if you’re the type who considers brie too “mellow,” mozzarella “bland,” or if you’ve already made fresh and subtle cheeses and now are aching to try something different (i.e. stinky). Sweet but stinky, funky yet lovable, washed-rind cheeses have no need to announce their presence in a room. Their legend and scent precedes them. Think of the orange-rinded Époisses, Red Hawk, Durrus, and Tallegio. It’s Not You, It’s Brie author and cheesemaking teacher will teach you how to make a wheel in the style of some of the world’s most delicious and loved funky cheeses, and guide you through the process of raising your cheese babe from infancy to orange-rinded adulthood. You’ll learn the basics of cheesemaking, milk science, where to source your milk and cultures, and how to age your cheese to it’s washed, orange-rinded, stinky, aged, perfection. The class is fit for beginners and advanced cheesemakers alike, but as a heads up, your cheese will need a little daily love for the first couple weeks.